On Wednesday, April 12, 2017, the spot price of gold found itself inching up 0.09 percent to $1,275.15 per ounce, the highest it’s been since November 10, 2016, which was at $1,279.80. With most recent developments in the Korean peninsula and the Middle East, investors have been seeking the safe-haven asset, gold. On Tuesday, North Korea’s Kim Jong-un warned the United States of a nuclear attack at any sign of American aggression, as a U.S. Navy strike group, which Trump called an “armada”, steamed towards the western Pacific. This threat helped move gold to close above the 200-day moving average for the first time this year, after struggling to do so over the past few weeks. The recent US strikes on Syria has added to investor’s aversion. This attack was prompted by the use of a deadly chemical agent against Syrian civilians, which killed at least 70 people — 10 children among the dead. According to a White House report, U.S. intelligence indicates that the chemical agent in the attack was delivered by a Syrian Su-22 aircraft which took off from the Shayrat airfield. Bashar al-Assad, Syrian’s president has denied that his military has used chemical weapons. President Donald Trump’s administration has gone forward and accused Russia of trying to shield Syria’s government from blame for a deadly gas attack. Speaking of the event, Vladimir Putin said today that trust had eroded between the United States and Russia, and Moscow has offered a hostile reception to U.S. Secretary of State Rex Tillerson as they face-off over Syria. There is much left unknown as heightened tensions effect the outlook of gold. Will gold prices continue to surge as risk aversion sweeps the financial markets or will this geopolitical impact fade? Since 1792, the United States Mint has had a long history of offering up gold, silver, and copper coins for sale, but it wasn’t until 2006 that the first pure .9999 24-karat gold coins by the United States Mint were offered up to the public. The impetus for the gold coin’s minting was the Presidential $1 Coin Act of 2005. This new act of Congress authorized the production of $1 coins (composed of copper with a brass cladding) honoring the Presidents of the United States. The intent of the act was to bolster public demand for a $1 coin following the failure of the $1 Sacagawea coin. It was believed that a new design would help the coins gain widespread circulation, considering how well the the State Quarter program had been doing. Along with the provision for the $1 coin, the Presidential $1 Coin Act mandated the issuance of a $50 bullion coin, which would be a reproduction of the 1913 Buffalo nickel (also known as the Indian Head nickel). [i] The intention was to offer a coin that could compete with foreign 24-karat gold bullion coins, as previously, other gold U.S Mint coins, such as the American Gold eagle, would be minted using 91.67% gold. 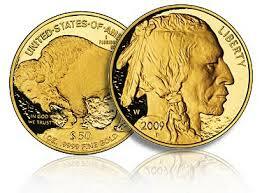 On June 22, 2006, the American Gold Buffalo became the first pure .9999 24-karat gold coins offered for sale. The American Gold Buffalo is a beautiful coin that follows the original design of the Buffalo nickel. The nickel, first struck by the United States Mint from 1913 to 1938, was designed by sculptor James Earle Fraser. The obverse (front) of the coin features the visage of a right-facing Native American Indian with a braid, and feather in his hair. Struck at West Point Mint in NY, only proofs will bear the “W” mintmark on the obverse (front) of the coin, behind the neck of the Indian. Along the upper right, the word “Liberty” is displayed, while the year is on the lower left. It was greatly debated, even throughout Fraser’s life, who had been used as the model for the Indian head. [ii] Fraser told inconsistent stories regarding the design, once stating that “[b]efore the nickel was made I had done several portraits of Indians, among them Iron Tail, Two Moons, and one or two others, and probably got characteristics from those men in the head on the coins, but my purpose was not to make a portrait but a type.”[iii] The right to take credit for the inspiration was highly contested, with many men laying claim to the honor. Whomever the model was, the design has endured and been reproduced countless times, making it one of the most iconic faces to be found on coins. The reverse (back) of the American Gold Buffalo, is said to depict Black Diamond, an American Bison, standing on a mound of dirt. Black Diamond was massive, the largest American buffalo who lived in New York City’s Central Park Zoo in the 1900’s. On the top of the coin, there are the words “United States of America”, and “E Pluribus Unum”. On the bottom left, under the buffalo’s head, can be found “In God We Trust”, which did not appear on the original Indian Head nickel, but has appeared on all U.S gold coins since 1908. Along the bottom can be found “$50” (this differed slightly from the original Buffalo nickel which showed a face value of “Five Cents”), and “1 oz. .9999 Fine Gold”. The Gold Buffalo coin has been met with great success. Since it first offering in 2006, over 2.1 million Gold Buffalo Bullion coins have been minted. [iv] With a mintage limit of only 300,000, and an enforced limit of ten coins per household, the 2006 proof version of the American Buffalo became highly sought. In 2008, along with the original $50 piece, $5, $10, and $25 coins were minted with 1/10 oz, 1/4 oz, and 1/2 oz of gold respectively. That year also offered a collectable, uncirculated version of the coin that was made available through coin dealers. By September 26, 2008, the U.S Mint announced a temporary cessation of American Buffalo coin sales due to surging demand brought on by the subprime mortgage crisis of 2008 which affected the price of gold. [v] In 2013, to celebrate the 100th anniversary of the original Buffalo nickel, a reverse proof version of the American Buffalo was offered. While the American Buffalo carries a legal tender value of $50 USD, the popularity of the coin and the increased price of gold have caused the coin’s value to climb. When the coin was first minted in 2006, the price of a proof coin was $800,[vi] but by 2011, the proof coin’s value was $2,010, and the price has continued to stay high. The American Gold Buffalo coin represents a beautiful work of art, and a meaningful piece of history. Fraser was inspired “…to do something totally American- a coin that could not be mistaken for any other country’s coin. It occurred to [him] that the buffalo, as part of our western background, was 100% American, and that our North American Indian fitted into the picture perfectly.”[vii] One just needs to look at the American Gold Buffalo to see that his vision was realized. [iii] Bowers, Q. David (2007). A Guide Book of Buffalo and Jefferson Nickels. Atlanta, Ga.: Whitman Publishing. [vii] Burdette, Roger W. (2007). Renaissance of American Coinage, 1909–1915. Great Falls, Va.: Seneca Mill Press. All data and information provided is intended solely for informative purposes and is not intended to be considered individualized advice or investment recommendations. You understand that you are using any and all information available on or through this site at your own risk. Coins give us a great glimpse into history, as they are often closely tied to the events of the times. This proves true with the American Silver Eagle. Throughout the 1970s and early 1980s there was a move to sell silver from the Defense National Stockpile to help reduce the national debt, but it had been met with congressional opposition[i]. Whenever there was a sell-off, or even an announcement of a sell-off, the price of silver would immediately decline. [ii] Futures traders would hear about the proposed sales, and they would begin to shed future contracts believing that the sell-offs would cause a drop in the price of silver. Then in the summer of 1981, the House Armed Services Committee made the move to allow the sale of government-owned silver to help with the financial budget. Both the House and Senate agreed to have 75% of the stockpiled silver, which amounted to 105.1 million troy ounces. [iii] This sale was to take place over a three-year period, but the response to this announcement had silver prices drop 11%. [iv] The United States silver mining industry, specifically politicians from Idaho (a major silver-producing state), argued that the sale would be detrimental to the industry, and a bill was signed to stop this sale of stockpiled silver. [v] It wasn’t until 1985, after many attempts, that the sale of silver was finally approved with the “Liberty Coin Act” amendment. 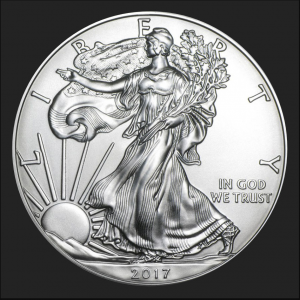 [vi] This new legislation required that stockpiled silver be used to mint coins, and finally, the American Silver Eagle was poised for its debut. On October 29, 1986, in the San Francisco Assay office, the first American Silver Eagle coin was struck. The American Silver Eagle is a beautifully designed coin. The coin’s obverse (front) pays homage to German immigrant Adolph A. Weinman’s Walking Liberty Half Dollar, which was minted from 1916 to 1947. The Walking Liberty had been a favorite of the public, evincing feelings of patriotism and hope, and the American Silver Eagle followed in its footsteps. As Secretary McAdoo said in 1916, “The design …bears a full-length figure of Liberty, the folds of the Stars and Stripes flying to the breeze as a background, progressing in full stride toward the dawn of a new day, carrying branches of laurel and oak, symbolical of civil and military glory. The hand of the figure is outstretched in bestowal of the spirit of liberty. The reverse of the half dollar shows an eagle perched high upon a mountain crag, his wings unfolded, fearless in spirit and conscious of his power. Springing from a rift in the rock is a sapling of mountain pine, symbolical of America.”[vii] The word “Liberty” frames the top of the coin, with “In God We Trust” on the right, and the year on the bottom. The reverse (back) of the Silver Eagle was designed by the twelfth Chief Engraver of the United States Mint, John Mercanti. The iconic eagle, which echoes the Great Seal of the United States, is portrayed with wings proudly held high, as he clutches arrows in his left talon, and an olive branch, the symbol for peace and victory, in his right talon. Above the eagle is a representation of the original colonies with thirteen five-pointed stars. Inscribed on the top are the words “United States of America”, with “1 oz. Fine Silver ~ One Dollar” along the bottom. On the banner that is held within the eagle’s beak there is found “E Pluribus Unum”, as well as any applicable mintmarks. The American Silver Eagles have continued to be made, and are offered as bullion, proofs, or uncirculated, with a few special issued editions. 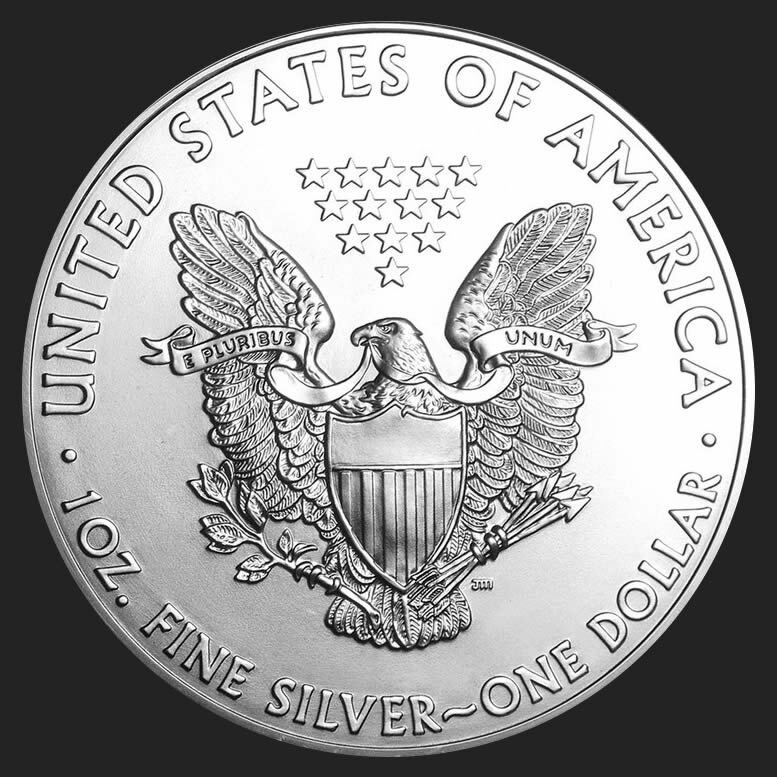 Silver eagle coins have been produced at the San Francisco, Philadelphia, and West Point Mints. The bullion coins do not have any mintmarks, but from 1986 to 1998, they were produced at the San Francisco Mint, between 1999 to 2000, they were produced at the Philadelphia Mint and West Point Mint. Since 2001, they have been minted at West Point, with supplementary production from San Francisco starting in 2011. Proofs will bear their mintmarks of “S” for coins made from 1986-1992 in San Francisco, “P” for Philadelphia from 1993-2000 and “W” for West Point from 2001 onwards (though in 2009 no proofs were minted). Uncirculated American Silver Eagles, which were issued from 2006-2008, and then again in 2011, were minted at West point, and bear the “W” mintmark. 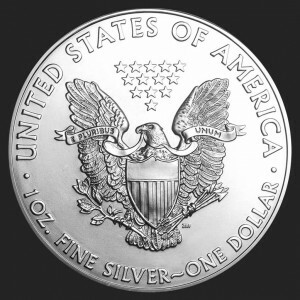 [viii] Special issues have been minted to mark historical occasions, such as the 2000 “United States Millennium Coinage and Currency Set”, which featured a 2000 Silver Eagle bullion coin, or the 2006 20th anniversary of the American Silver Eagle program, which showcased a special reverse proof. The American Silver Eagle has been a favorite of beginner and experienced collectors alike. Each American Silver Eagle coin carries a face value of $1.00 USD, but the intrinsic value is much higher. The silver content of the coin will never fluctuate, but the metal’s spot price will move as demand dictates. Since first strike, this coin has represented the beauty, history, and value that coins can bring to any collection. [i] “House Committee Rejects Sales of Silver from Government’s Strategic Stockpile”. Wall Street Journal. September 12, 1979. [ii] “House Refuses to Sell Any Silver in U.S. Stockpile: Compromise That Called for Sale of 5 Million Ounces Loses by Lopsided Margin”. Wall Street Journal. December 13, 1979. [iii] “Government to Sell 75% of Its Silver Stockpile”. Wall Street Journal. July 24, 1981. [iv] Lowenstein, Roger (September 18, 1981). “U.S. Plan to Sell Silver from Its Stockpile Depresses Metal’s Price 11%; Gold Drops”. Wall Street Journal. [v] Twight, Charlotte (1989). “The Political Economy of the National Defense Stockpile”. Policy Studies Review. 8 (4): 778. [vi] Amendment no. 418, 99th Cong., 1st sess., Congressional Record 131, pt. 12:16799-16800. [viii] Yeoman, Richard S. (2016). Bressett, Kenneth, ed. The Official Red Book: A Guide Book of United States Coins: 2017 (70 ed.). Atlanta: Whitman Publishing. [ix] “Rationing Ends for Silver Eagles”. Numismatic News. September 10, 2010.